THE GOVERNMENT IS failing in how it deals with child poverty, with the country regressing ten years in this regard. According to the Children’s Rights Alliance, the government’s performance in this area merits an ‘F’ grade – down from an ‘E-’ in 2014. Last year, a UNICEF report found Irish families with children lost the equivalent of ten years of income progress, ranking Ireland 37th of 41 OECD countries in their league table measuring relative changes in child poverty. Fergus Finlay, Chief Executive of Barnardos, told Newstalk Breakfast there are 130,000 children in poverty in Ireland, roughly “the entire population of County Mayo”. Tanya Ward, Chief Executive of the Children’s Rights Alliance, said the number of children experiencing consistent poverty has doubled since the beginning of the downturn in 2008. “We can only conclude that children were, and continue to be, the real victims of the recession. In its last year in office, how will the Government respond to these children?,” Ward stated. She said that families are struggling with rising rent prices, utility bills, personal debt, homelessness and food poverty, and called on the government to carry out a “social impact assessment in advance of budgetary decisions, ensuring Budget 2016 is poverty-proofed”. 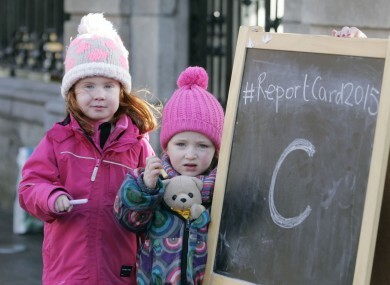 Overall, the government averaged a ‘C’ grade, getting ‘As’ for literary and school buildings. The issue of inequalities in family life receives a ‘B’ grade, a significant rise from last year’s ‘D+’. This is largely due to the publication of the Children and Family Relationships Bill. However, the Alliance’s report states that the lack of a Central Register for Statutory Declarations for Joint Guardianship continues to cause problems for some unmarried fathers who have not retained a copy of the declaration and are unable to prove they are a joint guardian. In the area of mental health, the government falls back to an ‘E’. Paul Gilligan, Chair of the Children’s Rights Alliance and CEO of St Patrick’s Mental Health Services said it is “extremely disappointing” that children are still being admitted into adult mental health in-patient units. The Irish State is failing children with mental health needs. This is not only a violation of these children’s basic rights but such practice will undoubtedly have long term consequences for the children themselves, their families and society. However, the Alliance welcomed identification by the HSE of Child and Adolescent Mental Health Services as a key Service Improvement Project for 2015. Significant improvements are also needed in relation to homelessness, and equality for Traveller, Roma and migrant children. In 2014, an average of 40 families became homeless each month, up from 20 families per month the previous year. The Alliance noted that while there was a significant allocation for housing in Budget 2015, there is “neither a national policy on the needs of children within homeless families nor a national target specific to reducing homelessness amongst families with children”. There are currently 96,000 households on the social housing list, on which people can wait for up to 10 years for a home. What is the Children and Family Relationships Bill and who will it affect? Email “The number of children living in poverty could fill Mayo”. Feedback on “The number of children living in poverty could fill Mayo”.